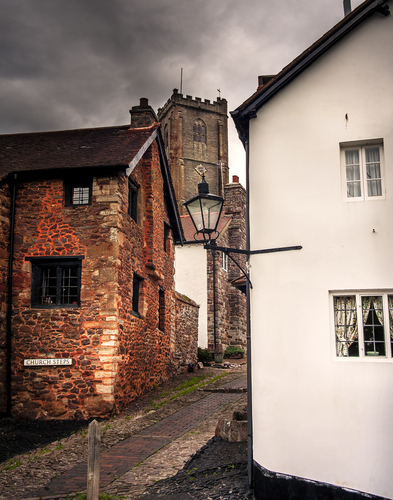 On the slopes of North Hill, viewed as a sentinel from far out to sea, is Minehead’s Parish Church of St. Michael, approached here by climbing Church Steps between old cob-walled cottages. Rich in history, this church is mostly fourteenth-century although the tower is of a later date, about 1500. From the window in the turret a light is said to have been kept burning all night, shining as a beacon to sailors.